Health insurers who have a low conversion of commercial to Medicare members may have an awareness issue. Challenges on increasing awareness include siloism among commercial and Medicare departments within health insurer corporations. Opportunities include creating strategies to encourage collaboration and incentives to provide the motivation for these groups to work together and provide the right Medicare plan to their commercial members. Deft Research examined the importance of awareness of Medicare offerings as eligible seniors age-in to Medicare. 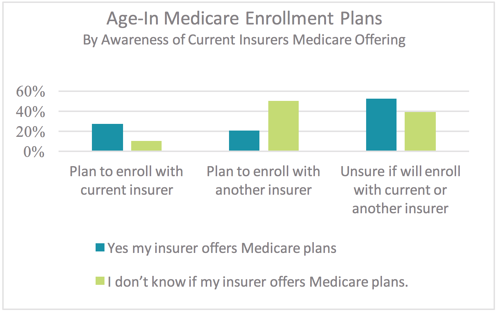 This chart shows the stark contrast between the Medicare enrollment plans of members who are aware of their current insurer’s Medicare offerings and those who are not aware. Members who are aware of their insurers’ Medicare plans are more than twice as likely to plan on continuing with their current insurer than to switch to another insurer. In contrast, members who are unsure about their current insurers’ offering are more than twice as likely to plan on switching insurers. Clearly, getting the word out to existing members is critical to avoid losing these members to competitors. Another strategy that we heard many plans using is a referral program. The program works well because commercial agents already have a relationship with the members, but Medicare agents have the Medicare plan knowledge. The referral allows members to learn about Medicare plans that are right for them, and the commercial agent participates in the meeting to build on the trust the member already has with the health plan. This provides a better experience for the member and strengthens the relationship that the member has with the plan. The Centers for Medicare & Medicaid Services’ recent guideline changes that focus more on educational materials versus member acquisition and marketing materials opens the door to referrals. Health care providers area a key source of referrals given their relationships with members and their understanding of their medical conditions. Holly Ackman from SCAN Health Plan emphasized the importance of training and education during her session of The 12th Annual Medicare Marketing & Sales Summit. The SCAN brand is built on developing relationships both outside of the organization with members and internally with other departments. SCAN aims to get the right information to the right people, so members feel like they’re heard and that the health plan knows their personal situation, which leads to a better member experience. Ackman said SCAN’s strong brand reputation has also led to Medicare members who are in their late 80s to refer the health plan to their children who are in their mid-60s. Deft Research’s syndicated research studies provide a national benchmark for health insurance carriers to gauge the Medicare and Employer Group and Individual markets. Health insurers that are interested in surveying their own members and prospects engage Deft Research in custom research studies to provide insight for their marketing and product strategies. Contact Deft Research with any questions you may have regarding syndicated and custom research needs.